John and myself hung over the weekend. We stopped quite a few estate sales, garage sales, pawn shops and a local GameXchange. He spent more than I did, but I feel I might found the one thing that was worth the journey. 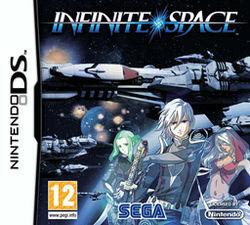 A European import of Infinite Space for the Nintendo DS developed by Platinum Games and published by Sega. Now before you say, "Why is that so special? It was localized for North American gamers". Yes, that is true, but I have never seen the NA version. So being able to find a United Kingdom import of the game at a local game store in the state of Oklahoma made it even more enticing. Oh! Did I mention that it only cost me $10? Well it did. On eBay this game sells for minimum of $30 to $80. So awesome find. I've already played about thirty minutes of IS and this is a very interesting game. Strategy, Tactics and Role Playing come to mind so far. On top of this being a Sci-Fi setting makes it a must for me. The characters already appear to be over the top, which is just a Japanese staple (especially Platinum Games, heard of Vanquish and/or Bayonetta?). I haven't really been able to give enough time to fully grasp the gameplay, but it seems to take cues from the Tales, Final Fantasy, Star Ocean and possibly a tactical Star Trek game like Armada. It was fun experience finding some rarities. John did find an Odyssey 2 from a pawn shop for $8. And it actually started right up on the first try. Football! came with it and at first it appeared to be a very one diminisional game that had absolutely no player detail control. It was just one play for both offense and defense and the AI was terrible (this was from the 1970's however). Once we were about to call it quits with the game we found a slightly different pattern and both sides' AI played differently. You see to make up for the lack of buttons on the controller the plays can be called according to the direction the player pushes the control stick. This added more depth and we continued playing. Adding the system to the Video Game Olympics and I took the game and system. There was just that one game though. Don't forget to follow this blog using the handy tools along the right side of the screen! Nice find! It's always fun to find a rare game for cheap. I was pretty happy to find the Dreamcast version of Skies of Arcadia for $5 in a thrift store not too long ago. Love that game. It really was a great find. I still think it is weird that I couldn't find the American version anywhere (locally speaking) and before I see it, I see the import version for 10 bucks. Skies of Arcadia is fun and amazing that you found it that cheap.